This is my favourite payasam.I made it yesterday for my birthday and i enjoyed every mouth to the core .. Its very easy and can be made in jiffy. Many variations can be made to this payasam recipe by adding finely chopped nuts or badam powder or saffron milk , condensed milk and it tastes more delicious. Its a simple but rich dessert.. 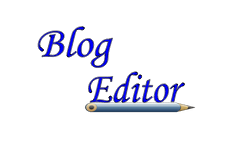 I hope most of u have this post in ur blog. 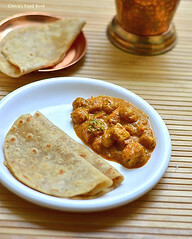 I do have this recipe in my Kerala Onam sadya post using milk.. Here i have shared the basic method .Do try n let me know ur feedback.. 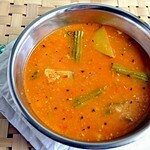 Adjust the quantity of milk from 1/2 to 1 cup based on the consistency u need as this payasam thicken when it cools down.. In a wide bowl , take the water and roasted vermicelli and allow it to cook for 10-15 minutes till it becomes soft to touch and breakable.There should be some water left with the semiya. Now add the sugar and mix well till sugar dissolves completely.Let it boil in low flame for few seconds. Then add the elachi powder or rose essence and milk.Stir well , Give a boil an switch off the flame. 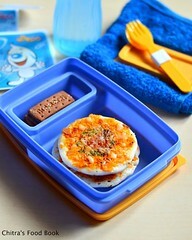 Serve hot or cold ( refrigerate it) !! Yummy payasam is ready !! Usually I make aval payasam or moong dal payasam for friday pooja.Today being Aadi velli , i made this sweet pongal ( Chakkara pongal/sakkarai pongal in Tamil) in a pressure cooker easily. 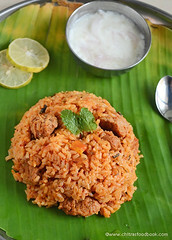 I usually make sakkarai pongal for aadi velli , aadi perukku & thai pongal. For the other occasions we make rice payasam mostly. I have already posted an authentic, traditional sakkarai/ sweet pongal about how to make sakkarai pongal in venkala paanai (pot). In this post , i have mentioned our usual method of making sweet pongal using pressure cooker. To make perfect sweet pongal, always use good quality raw rice & dark colored jaggery to get the best results in color & taste.Its very flavourful , tastes similar to Kovil pongal/temple pongal and u’ll love it for sure. Try this & let me know dearies . Check out the video too ! Sweet pongal/Sakkarai pongal - Video ! Sweet Pongal recipe-Sakkarai pongal -How to make Temple style sweet pongal recipe at home using pressure cooker. In a kadai , heat 2 tsp of ghee and roast the cashews , raisins, cloves & jaathikai. Powder the jathikkai and set aside. In the same ghee , roast the moong dal till golden brown with a nice aroma. In a pressure cooker base , take the washed rice & 3 cups of water. Add the roasted moong dal along with a pinch of salt. Pressure cook for 4-5 whistles till rice & dal turns mushy.Open the cooker & mash the rice , dal very well with a ladle.. In the meanwhile , prepare jaggery syrup. In a wide bowl , take the jaggery with 1/2 cup of water and allow the jaggery to melt completely. Strain the impurities and again boil the syrup till it becomes frothy. Remove & add this syrup to the cooker. Mix well and add 2 tsp of ghee to avoid the pongal sticking to the bottom.Stir very well for 4-5 minutes till all the syrup gets mixed. Pongal will start to thicken and leave the sides of the cooker . At this stage add the remaining 2 tbsp of ghee and the roasted cloves , cardamom powder,edible camphor powder & roasted jaathikai powder..Mix well & switch off the stove. Initially it will look semi solid in consistency. But it will thicken as time proceeds.Before serving u can reheat it adding little milk or water. 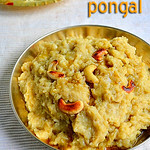 If your pongal looks dry when warm , add little ghee & milk ,reheat it n serve ! It tastes divine !!Enjoy ! Always add more ghee at the end for a nice flavour . It also makes the pongal soft & non sticky. Milk can be added if pongal looks dry or hard. But addition of milk reduces the shelf life , color will slightly change and also the sweetness gets reduced.. For the above recipe u can add 1/5 cup of milk to the max..
Use dark colored paagu vellam to get a nice color. 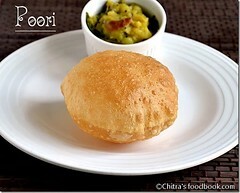 I have already posted urad dal vada with pepper in mixie. In that post I have mentioned the different methods used to shape vadas.By seeing that post many of my friends mailed & asked me to post a video on how to grind the vada batter using mixie & how to shape vada using a sheet and some easy tips to identify the consistency of batter..I was hesitant in the beginning whether I could do this and i wanted somebody to help me taking the video. Recently my in-laws visited my place and with the help of my MIL i took this video by keeping beginners in mind.The batter yield will not be good when we grind in mixie as compared to grinder.But i am sure u’ll get the taste & crispness equal to grinder batter…Please bear the mistakes in this video as this is my first attempt. I hope I can do it better in future & update here.I am also a beginner and i am still in the learning and experimenting phase.Most of us miss the batter consistency adding more water. So I have tried to give the exact water quantity I used .The quantity of water slightly differs as per the quality of urad dal.So keep this video as reference and adjust the water quantity.I have also given some tips in the “Note” section to adjust the consistency of batter if it is watery.Experts,please excuse and do share ur tips in the comments section. Recently I had vada for breakfast in AAB. I found jeera , pepper corns , onions and curry leaves . So I too started making in that way as my husband loves pepper more than onions. Here i have mentioned pepper & jeera in the ingredients list. For poojas & festivals we add only pepper.. Add onions alone or both onion & pepper as per ur wish.But remember to add onions just before frying vada else onions will leave water and make the batter watery. Always keep the batter refrigerated till use.No problem if one or two tsp of water goes extra. Batter will thicken if u refrigerate it. If u find the batter too watery , add few tsp of rice flour to make it thick & to make a proper shaped vada . But u should serve it hot . Otherwise vadas won’t be crispy in room temperature.Also if u add less water to grind the batter , vada will be hard. If u add the correct water & grind the batter , vada will stay crispy even after it cools down . Vada won’t drink much of oil if the batter is right. My MIL used to add a tsp of toor dal while soaking urad dal to avoid oil absorption. Beginners can follow this method.Some people soak little raw rice along with urad dal or add a tsp of rice flour to the batter. All these are not necessary if u grind the batter in right consistency..
Ok friends , let me know ur comments if u try this method. Good luck. Do check out my mixed vegetable vada if interested ..
Wash and soak urad dal for 1 hour to 4 hours (maximum) and keep it inside the fridge( refrigerator).After soaking, drain all the water completely and keep in a bowl. Use this water for grinding the batter. Choose a bigger sized mixie jar to hold the urad dal batter. ( jar should be double the size of batter). First grind the green chillies , ginger piece without salt. Grind it coarsely without adding water. Drain the ice water from soaked urad dal. Reserve it for grinding. 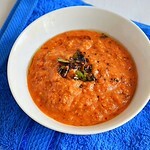 Then add the urad dal without water and grind for few seconds till it becomes a coarse paste. Now add 1/3 cup of ice water and grind for a minute till smooth. Open the jar , wipe the sides & check the batter. . If it is slightly coarse , add 1 more tsp of water. ( Always add in tsp or tbsp further).. Again grind & check the consistency. Batter should be thick, fluffy n smooth. When u drop the batter , it will slide slowly & it will form a stiff peak. One more tip is, drop a small quantity of batter in a bowl of water.It will float on top.Remove the batter to a bowl. Add some water to the jar, run the mixie once. Use this water for dipping your hands while you shape vada. Refrigerate the batter If you fry later. If making vada immediately, add 1/2 tbsp of rice flour and beat the batter well for 5 minutes. Just before frying vadas , add the finely chopped onions , curry leaves and whole pepper corns & 1/2 tsp of jeera, salt. Mix well. Dip your fingers in the urad dal washed water , shape the vadas . Deep fry on both the sides till onion turns golden brown , remove , drain in a tissue paper & enjoy eating hot as evening snack with coffee ! Please watch the videos for better understanding .. Hope it is useful. Do not add salt while grinding the vada batter. Add salt, onion just before frying else it will make the batter watery. 1/4 cup is the minimum quantity of water needed to grind the batter. It differs based on the urad dal. But after adding 1/3 cup , add water in tsp and check the batter every now & then. Please don’t add too much of water. If u add more water,vada will drink more oil.To avoid oil absorption,u can add 1/2 tsp of toor dal along with urad dal while soaking. The quantity of batter may not be more as u get in grinder. In grinder, we get batter for 25 medium sized vadas .In mixie , u can make 12 vadas. Vada will absorb more oil if u deep fry in low heat oil.Heat of the oil should be right. It should not be smoky. If u deep fry when the oil is too hot , vada will brown quickly but the inside portion will not be cooked . For proper cooking , always check the heat of oil by dropping a bit of batter. If it rises immediately , oil is in the correct temperature. Adjust the flame to high and medium high while deep frying. Deep fry in medium low flame for long time to get crispier vadas.For onion vada , u should remove the vada when the onions turn golden brown.For pepper vada , remove it when the sound ceases & turns golden brown. Shaping of vada comes only by practice. Start using a sheet or ladle for shaping. Then u can make it directly using ur hands. Enjoy eating hot with coffee or tea !! I tried this brinjal kosumalli recipe from kumudham supplementary book. 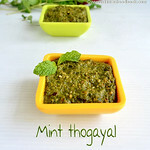 It is a good side dish for idiyappam , idli & dosa. 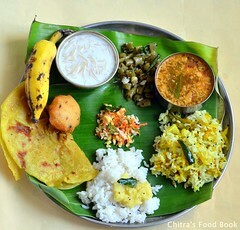 It is one of the traditional Chettinad recipes. 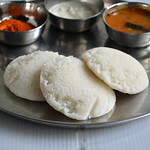 We relished with idli rava idlis. It was very tasty. My husband is not fond of brinjal recipes but he loved this kosamalli a lot. . Ok, Lets see how to make Chettinad special Kathirikai Kosumalli recipe with step by step pictures. Slit brinjal into 4 pieces & cut the potato into two pieces. Pressure cook brinjal & potato for 2 whistles. Reserve the cooked water. Remove the skin of brinjal & potato and mash them well. Soak tamarind in warm water & take the extract. Set aside. In a kadai , temper mustard seeds , urad dal , red chillies & curry leaves.Then saute onions , green chillies & tomato pieces. Saute for few minutes. Add the drained water from the vegetables & allow it to boil..
Now add the mashed vegetables & tamarind extract.Allow it to boil for few minutes.This gravy should be slightly watery.Garnish with plenty of coriander leaves.